Mobile ad hoc network (MANET) is a self-governing system of mobile nodes which is an infrastructure less network and requires no centralized management. Mobile ad hoc networks are self-organizing and self-configuring network where, the structure of topology is changed arbitrarily and communication will take place via radio waves at anywhere and anytime. The goal of Quality of service (QoS) is to provide a better service to the selected network traffic. QoS for wireless is more challenging than wired network due to node mobility and resource constraints. This paper discusses various classification of routing protocols in MANET and the QoS parameters like end-to-end delay, energy, bandwidth, packet delivery ratio, jitter, throughput and so on for different types of routing protocols such as proactive, reactive, hybrid, power-aware, position based which are used in mobile ad hoc networks. K Jothimani, P Gomathi. "Routing Protocol Classification and Improving QOS Metrics: A Survey." 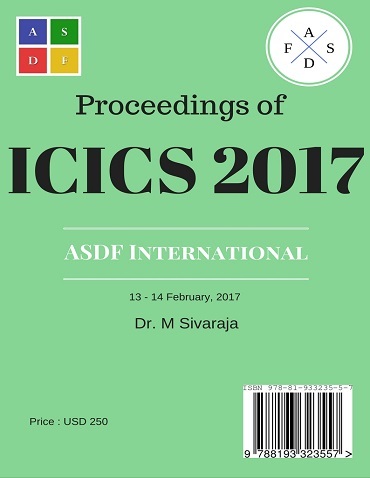 International Conference on Intelligent Computing and Systems (2017): 24. Print.